In high school English class I remember learning about the technical elements of poetry: stanza and verse, rhythm and rhyme, couplets and quatrains, foot and meter. These were the aspects that helped to categorize poems, to distinguish one style from another. Yeah, but do poets really think about all this stuff before they write a poem, or is it only afterward that they go back and figure out everything they did? The writing of poetry had always seemed to be much more of a spontaneous, mysterious process to me, and I couldn’t imagine a poet actually sitting down with a blank piece of paper and thinking so technically about how they were going to frame things out before they began. 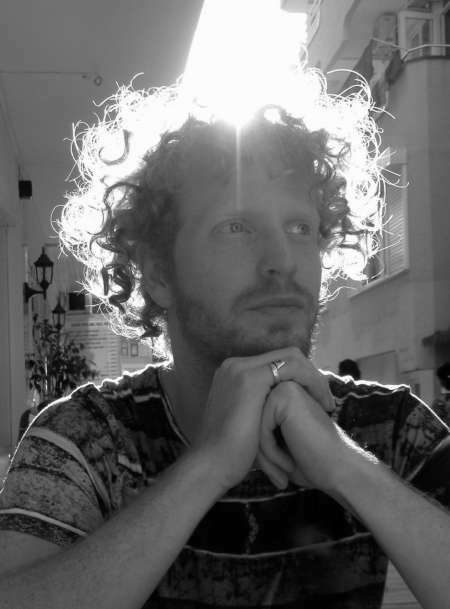 Turns out those sentiments also apply to the experience of singer, songwriter, and guitarist Jono McCleery. “I didn’t spend time doing the usual lessons, scales, learning chords. I just experimented, wrote songs, and felt my way through by ear. I still don’t understand much of the theory behind my own music. Not that it’s bad for a musician to know all the theory and building blocks behind a composition, of course. But for Jono, it was something very close to home that inspired him to start developing that musical identity: His father was once a full-time jazz musician. “In the ’70s he played piano with a jazz–rock fusion band called Ben who released one self-titled album with Vertigo Records. Then when he had children he decided to quit the music scene and move onto other things. I don’t remember well enough, unfortunately, but I know he loved Bill Evans, and he loved to improvise. What I love about jazz is that you have more freedom to express your individuality, and live in the moments within your performance. The musicians I feel that do this the best tend to inspire me the most. But as much as I try to articulate what it is I like about them, I think ultimately – hearing my father improvising on the piano as I would sleep when I was a child split my mind and ears open for life. And furthermore, losing him at the point which my memory fades somehow allows me to use this kind of music as a way to stay connected to him. Every so often when I’m reading a book I’ll be struck pretty hard by a certain passage. When that happens, I’ll find a piece of scrap paper and mark the page, and even sometimes write myself a little note for later, describing what it was that had such an effect on me. —A week. Over a week we’ve been locked up in here. Like rats. Worse than rats. I’m sick of hiding under mattresses. How long can this go on? Who would dream this could happen in the capital? Never in my life… Ay, my head feels like it’s struck with a machete every time that cannon goes off. How can anyone sleep in this hell? And how am I supposed to feed us with only a clove of garlic and two tomatoes in the pantry, tell me. But look how happy you two fools are. How pretty. One busy playing with the fringe of her shawl, the other playing the piano. Eleuterio said nothing. How could he defend himself? His wife didn’t understand about art, how by creating something you can keep yourself from dying. Regina only understood pesos, not the mathematics of the heart. There’s a strong notion in that second paragraph about just how powerful music can be, and really, how powerful it’s always been – good times or bad. So in a similar way, just picture Jono in his youth – hearing his father play the piano, listening to soul records, and singing along. It was not only an early connection to music, but an intimate one as well. He’d grow older, and the experience would eventually provide Jono with a new motivation to learn how to play the guitar. And then he would be moved by that power of music to the highest degree. “My main motivation was that I really wanted to play and sing live, be it on my own or in a more professional setting. I would listen to the way John Martyn and Nick Drake played and learn to appreciate how they made the instrument a part of their voice and musical identity, and try to recreate that in my own way. Listen to his voice for a few moments, and Jono’s musical youth makes perfect sense. But it’s not just the voice of a soul singer you’re hearing. Not just the voice of an entertainer. It’s soulful, yes, but also welcoming; warm; captivating. It’s what first grabs your attention. Then keep listening. Go through a few more songs, and underneath that voice and that soul you’ll also hear definitive classical and modern influences. Insert an occasional non-standard time signature as Jono does, and it’s quite a blend. When was the last time you heard a musician combine soul with classical? These are the things that set the music apart. And they’re also what will make it lasting. Because although Jono’s sound may not identify with one certain style, or with one certain decade’s music, for example, there is enough of a familiarity for the listener – something comfortable to the ear in that voice and those harmonies and compositions. It all gives the music a quality that’s both unique and timeless: contemporary a year from now, 10 years from now, 40 years from now. Rare is the artist who can create such music. Think of what they’ve got to navigate, all they’ve got to do to try and capture a listener’s ear nowadays. I wondered what that feels like. After all, people don’t exactly take the time to sit down and listen to music with each other, or play music for each other, like they used to. Jono’s answer had the same rich, thoughtful tones as his music. “I think for many of us life has become much quicker. We can do lots of things at the same time, and music is something we listen to whilst we’re on the move. And because it’s so easily obtained perhaps we undervalue it.